League of Legends is seriously the least interesting game on the planet. We’re reluctant to even link to footage of it because we don’t want to be charged with homicide by boredom. Seriously, it’s not a great game, by any normal definition. But it makes some competitive players very rich, including at least one 18-year-old. 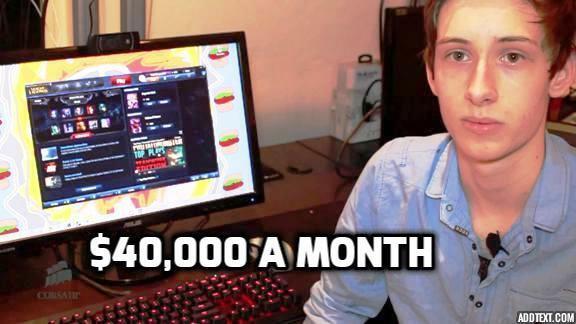 Bjergsen (his gamer name, like Neo was Keanu Reeves’s digital name) is an eSports player who makes around $40,000 a month. Of course, that’s just an approximation. We have no idea how much he … oh, we do know how much he has? And it’s $120,000 from 24 tournaments? Jeez. All right, everyone whose parents ever told them video games were bad for you or rotted their brain, take this article and shove it in their faces. And then start playing games. You want to be rich don’t you?